If you’re looking for a ‘certain something’ that doesn’t cost anything more than what you’d pay in the High Street (and in some cases, considerably less), then a wander through the Marais district in Paris might just be what the money doctor ordered. Dubbed the “haut-lieu du vintage” (the high place of vintage), the Marais has the kind of spindly streets and vein-like lanes that beg for discovery. We know that Paris is renowned for its haute couture, luxury brands and boutiques, but what might not be more widely known is that second-hand clothes shops are to be found in each arrondissement – although in our opinion and experience the best are in Marais (with Montmarte a close runner-up). On a beer budget with a Brandy Alexander taste? Then hunting through Marais will be right up your boulevard. What's It Like: With a suitably evocative soundtrack of early blues music, Mam’zelle Swing is easily the classiest and airiest of the vintage shops we encountered. While not overly crammed with items, the women-only stock is clearly chosen for its niche style than casual-shopper appeal. Interestingly, there’s no obvious signage for this shop, but keep an ear out for Bessie Smith or Billie Holiday and you won’t go too wrong. What To Buy: If you’re keen on fashion from 1900-’60, or on the lookout for matching up a rare enough jacket with shoes (as well as accessorizing with bracelets, bangles, gloves, belts and bags), then this is the place to come to. Most items are reasonably priced, with many well below €100. Unusually for a shop of this kind (but in keeping with its innate chutzpah) visitors to its website can order items online. What TCL Bought: A bangle (hey - it was for the wife. Honest...). A gift at €12. Where To Eat/Drink: If you want to spend some of the money that you have saved by being trés thrifty, try lunch or dinner at Le Dôme Du Marais, 53bis Rue des Francs Bourgeois. Great location with a stupendous octagonal-shaped dining room. 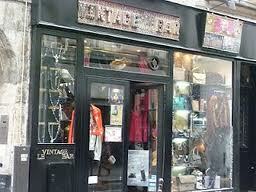 What’s It Like: This is a tiny vintage clothes shop that every time we passed was packed to the gills. Unlike other shops we visited, male and female clothes have devoted, quite defined sections. The shop receives new stock at least once a week, so while the amount of clothes on display seems substantial, it’s rare that you’ll see the same article of clothing twice. 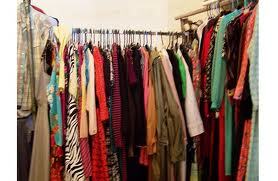 It is noted for having the most on-trend second hand clothes in the city. 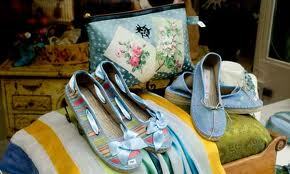 What To Buy: The usual array of clothes is complemented by a wide range of belts, bags, boots and shoes. What TCL Bought: A Belgian army shirt – black, with handy zipped and buttoned pockets, and a combined zip/buttoned front. We’ve seen similar designs popping up in various High Street stores, but this is the origin of the species, and looks way cool. A snip at €10. Where To Eat/Drink: Café Marianne, 2 Rue des Hospitaliéres St Gervais. People queuing to get in is always a good sign of quality – and we mean quality: choose from excellent hummus, kefta, tahini, tapenade, falafel and pureed eggplant. What’s It Like: A short walk away from Coiffeur Vintage, this far larger shop is also known as King of Frip. Again, this is as busy as Connolly Station in rush hour, and at first sight the volume of clothes on display is off-putting. Patience, however, is a necessity in second-hand clothes emporia, and if you stick at nosing around and sifting through piles of aisles and boxes aplenty, then you’ll definitely come up with a treasure. What To Buy: Loads of leather jackets for the men, and surely too many ‘60s/’70s dresses and accessories for the women. What TCL Bought: A granddad patterned silk scarf, of which there were plentiful. A steal (so to speak) at €8. Where To Eat/Drink: Mosaique, Rue du Roi de Sicile. A perfect place for a sit-down Americano and a wide range of tasty filling sandwiches. What’s It Like: What’s the difference between a jumble sale and a bargain basement? My French is virtually non-existent, but if this place isn’t what they term “un joyeux bazar” (“a real mess”) then I am indeed what an ungraciousness French person might call “un oncle de singe” (“a monkey’s uncle”). That said, you get a strong sense that the owner, Laurent, is very careful about what he chooses to stock. What To Buy: This is home to more than just clothes; its commercial remit also embraces old toys, comics, Bakelite telephones, runners and magazines. There’s a decidedly retro ‘70s feel to everything, and despite the fact that its stock of second-hand clothes was nowhere near as extensive as other stores it was probably my favourite place of them all. What TCL Bought: A French edition of the Walter Carlos soundtrack to Stanley Kubrick’s A Clockwork Orange (although in the TCL household it shall be known forthwith and forever as Orange Mecanique). A bargain at €7. Where To Eat/Drink: Le Petit Dragon, 32 Rue Saint-Paul. A small, efficient bistro several steps away from Aux Comptairs du Chineur – ideal for a pick-me-up or sit-you-down 20 minutes before entering the world once more. What’s It Like: Although tiny, oven-hot and not lit very brightly, this place is wall-to-wall vintage (indeed, one wall is stocked and stacked with purses and boots). Apparently, it once had a reputation for being the most disorganized thrift shop in the city, but latter years have seen the dismantling of chaos and a return to order. Be prepared to lose your arms as you dig deep for bits and pieces in the €3 and €5 bargain bins. Also, those with vertigo might want to avoid stepping down the tightest corkscrew staircase you’ll ever teeter on (but which leads you into a basement of incredibly inexpensive leather jackets). A fave haunt of visiting film stars, apparently. What To Buy: Anything, basically, in the aforementioned bargain bins, but there are also mounds of leather bags and belts, racks of retro t-shirts and surely more dresses than you’d ever wear in a lifetime (although this is possibly a very naive thing to say for a man who isn't a transvestite). What TCL Bought: A smart’n’sharp punk-thin tie, not seen since The Adverts played Top of the Pops back in the late 70s. A ripped'n'torn giveaway at €5. Where To Eat/Drink: Lizard Lounge, 18 Rue du Bourg-Tibourg. A perfect spot for a pre-shopping brunch or a post-shopping beer, this is a three-level bar/club with a more than generous 180 minutes happy ‘hour’ from 5pm-8pm. FLEA MARKETS TO VISIT It takes a resourceful if not resilient type of person to spend more than an hour in a flea market, but if you have a will then you’ll have a way to negotiate your legs and bargaining powers through the following: Marché aux Puces de Montreuil, Avenue du Professeur André Lemière: well known throughout the city (and, indeed, France) for its quality second-hand clothes and designer seconds. Approximately 500 stalls. Marché aux Puces de St-Quen, rue des Rosiers, Avenue Michelet, Rue Voltaire, Rue Paul Bert, Rue Jean-Henri Fabre: said to be Europe’s largest flea market. Think miles of second-hand clothes stands, as well as anything else you can think of. Over 2,500 stalls (gulp!). Comité des Fêtes, Brocante at 2 Rue Eugene Spuller, Square du Temple: twice yearly (May and December), the Comité des Fêtes organise a sizeable flea market that takes place over a weekend. 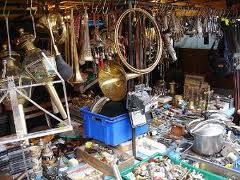 By all accounts, there is amazing value to be had, with some objects sold from one euro upwards. After seven in the evening, apparently, if the vendors haven’t shifted what’s on their stalls they give it away for free.